Krenn examines and discusses sociopolitical topics. He uses various media such as photography, video and web-based tools to develop projects realized in exhibitions, public space and on the internet. The project „Point of Leisure“ is an installation in public space. It is a temporary social sculpture in the pedestrian area in the City of Eindhoven. The project addresses the question of a new definition of work and leisure in the 21st century. A tent in public space mark an area with a comfortable couch, a sofa, a small coffee table. 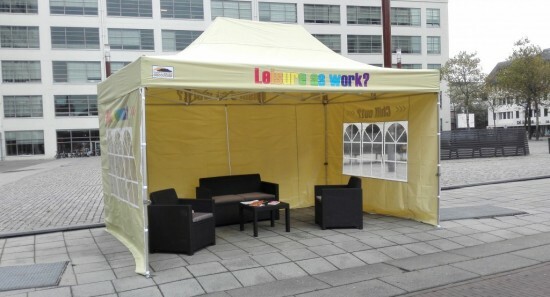 The tent symbolises protest on the street, whereas the couch and coffee table (with literature about unconditional basic income) stand for relaxation, thinking and reading. What about an unconditional basic income? During three days (26th to 28th September) the artist Martin Krenn is at the site, sitting on the sofa, reading books and talking with passers-by as well as with guests/experts who are invited to have a seat and drink coffee and tea with him.